First lady Michelle Obama reads the "Top Ten Reasons to Watch the Democratic National Convention." Michelle Obama is becoming a regular on the "Late Show with David Letterman." The first lady made her fourth appearance on Letterman's show Wednesday to help the late night host with his Top 10 list, a night after painting an intimate portrait of her marriage to President Barack Obama at the Democratic National Convention. Just last week, Mrs. Obama made another appearance on "Late Show," her third this year, where she confessed to not watching the Republican National Convention. This time she provided 10 reasons why Americans should tune in to her party's big event, which culminates Thursday with President Obama taking the convention stage in Charlotte, N.C. to make the case for his re-election. From low-fat confetti to promises of no Kiss Cam moments, here are Michelle Obama's "Top 10 Reasons to Watch the Democratic National Convention." 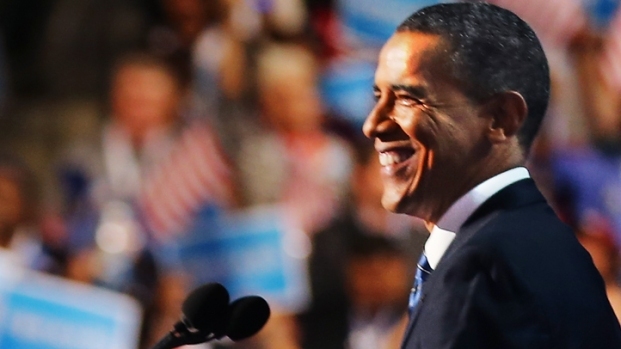 10) Spoiler Alert: the Democrats will nominate Barack Obama. 9) It's like having a crowded convention center right in your own living room! 8) You don't have to be a Democrat to enjoy balloons. 7) Finally, you get to see some coverage of the presidential campaign. 6) As a healthy alternative, we're using low-fat confetti. 5) If you were appearing at a national political convention, I'd watch. 4) There will be no Kiss Cam. 3) It's got to be better than what you're watching now. 2) Joe Biden says it'll be "a big 'you-know-what' deal." 1) At long last, I'll reveal who I'm voting for.